Upaya is a term that is used in Mahayana Buddhism as a reference to a method of teaching liberation through conscious and voluntary action without reasoning the direction. In other words, they are short cuts that are created for students to expedite them along the path to enlightenment. It is essentially adaptations of certain teachings to bring the practitioner closer to the goal of enlightenment, even though the teachings may be untrue. The use of skill is extremely important here because one needs to adapt teaching to the audience that is receiving the message and teachings. The concept was revolutionary for Buddhism and has some powerful implications. It essentially allows for skillful teachers to show the student half-truths to reach further into the path of awareness and enlightenment. In Buddhist tradition, it was later understood that the Buddha had given his followers various upayas, rather than whole truths, because they were not ready for the ultimate truth. This allowed for many of the prior doctrines of buddhism to be disregarded in favor of higher ones. This allowed buddhist practitioners to build a kinda of step system from the elementary teachings of Buddhism into the most advanced and profound. The most important aspects of teaching this way are through skillful means guided by compassion and wisdom. This means treating each person as a different potential, because of their different capacities and ability to comprehend the lessons. This is used to explain some of the crazy wisdom that buddhist monks and practitioners use when teaching, including an example where a monk slammed a door shut on a disciples leg and in the process gave him a deep insight. There are two primary examples or metaphors that are used to explain the concept in Buddhism: an empty fist and a burning house. In the example of the burning house, a man uses white lies to get his sons out of a building that is on fire and to get them to safety, because he knows that they will not pay attention if he tells them the truth. The empty fist is used as a metaphor to grab the attention of children, but really it is a teaching to allow the student to understand the emptiness and to focus on the essence of mind rather than the distractions of it. Both teachings are understandably adapted to each situation and each student. The teachings are quite powerful and you can read about them in Lotus Sutra, a Chinese buddhist text from around 300CE. These teachings are powerful for the modern world, showing teachers to meet students where they are and to teach with compassion in a system that is optimal for the aspirant. Modern yoga does a very good job of doing this. Nirvana is a Sanskrit word that literally means ‘blown out’. In Indian religions, this is the achievement of moksha, or liberation from reincarnation. Nirvana refers to the extreme silence of the mind after one has tempered the fires of desire, aversion, and delusion. It is most commonly associated with Buddhism, though Hinduism and Jainism use the concept in association with their versions of enlightenment. Overall, the three agree that it is a release from Karma. In Jainism, Moksha and nirvana are interchangeable. Moksha is release from karma. The Gautama explains it as a safe place without old age, sickness, death, or disease. It is safe, happy, quiet, difficult to reach, but those who reach it are free from sorrows, and have put an end to the stream of existence, reaching complete peace. Buddhism shares very similar views to those of the other indian religions. The Buddhists call it perfect peace, when all cravings are eliminated. When the forces of raga(attachment), dvesha(aversion), and moha/avidya(ignorance) come to an end, so does dukkha(suffering). Hinduism‘s views of nirvana are a bit different, many apparently consider nirvana to be a buddhist term, though there are some that say that from the Bhagavad Gita onwards the term has been linked with Brahman, the absolute principle from the Upanishads and the Vedic traditions. The religion occasionally uses nirvana in place of Moksha. Moksha infers liberation, meaning to be set free of bonds. The nirvana of the Gita directly contradicts buddhism in that a person attains egolessness and unison with the Brahman, rather than perfect stillness. Buddhism has differing approaches to the enlightenment of the buddha, Mahayana Buddhists believe in Dharmakaya saying that the buddha was born to benefit humanity and is one aspect of the buddha while Theravada Buddhists believe the buddha achieved libertation through human efforts. The Dhammakaya movements in Thailand and India view the true self of the buddha as being present in all beings. Nirvana is death in much of the buddhist traditions. It is the ultimate freedom of life and most Buddhists consider it to be the aim of life. The buddha teaches the way. Siddhartha Gautama, or the buddha, is the sage whose teachings were interpreted to form Buddhism. ‘Buddha’ means awakened one, or enlightened one and is titular for the first awakened being of an age. Siddhartha is the supreme buddha (Sanskrit सिद्धार्थ गौतम | samyaksaṃbuddha) and taught a middle way between the opposing philosophies of indulgence and asceticism in the eastern regions of India in about BCE. Most of the traditions of Buddhism were passed down by oral tradition through monasteries and about 400 years later were committed to writing. The majority of scholars today believe that he did indeed live during the Mahajanapada|महाजनपद era in India thus making him a younger contemporary of Mahavira, the Jain teacher. 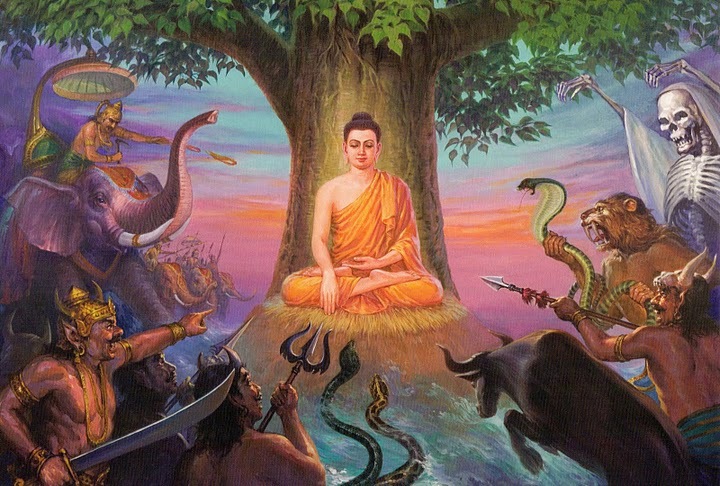 The Buddha had teachers, many that are very notable: Alara Kalama, Udaka Ramaputta who appear to have taught him meditative techniques. He was also influenced by many contemporary thinkers like Purana Kassapa, Makkhali Gosala, Ajita Kesakambali, Pakudha Kaccayana, Sanjaya Belatthaputta, and the Vedic Brahmins. There are many traditional biographies that historians disagree with, but that are very interesting for understanding the religion as a whole. The Buddhacarita is an epic Sanskrit poem by Asvaghosa, who wrote in classical Sanskrit. The Lalitavistara Sutra, Mahavastu, and the Nidanakatha are other accounts of the Buddha’s life, leading to different traditions and accounts. He was born a Sakya, either in Uttar Pradesh India, Nepal, or Piprahwa, but tradition states him as being born in Lumbini, Nepal. The Buddha denied being man or god, but the stories of the scholars bring light to the man after whom the religion is based. His story was elaborated upon time and again in tradition after tradition, but the ending is always the same: Siddhartha sits under the Bodhi tree for 49 days and becomes enlightened. The buddha awakes. He realized the cause of suffering and how to eradicate it with use of the four noble truths striving to attain Nirvana|निर्वाण or the ultimate stillness. Hindus refer to this as an extreme egolessness, or quietness of the mind and unison with Brahman. The buddha described it as perfect peace. The buddha lived and taught for a long time, and his death seemed to be somewhat voluntary, though his last meal might have been pork. Tradition even dictates that he may have been somewhat sexist, refusing women into his following at first. At first, the buddha didn’t even want to teach! He doubted that human could grasp the subtlety of his message, or the intricate complexity of its meanings. The authenticity of much of the buddhist religion’s traditions are in question, but they seem to be at least based on the original Gautama. The core principle of buddhism, dhyana, or object-based meditation is maintain across all traditions, as is the concept of liberating insight. However, scholars believe that the buddha’s teachings were likely personal and that the eightfold path and four truths may have been expounded upon after the buddha’s passing. Many find evidence only for a middle path or middle way. Some Hindus regard the buddha as the ninth incarnation of Vishnu. The stories you have heard and likely largely exaggerations of the buddha’s birth and upbringing. There really was a buddha, very long ago, though his teaching was likely very different from its depiction today and was likely very personalized to each individual, though he never claimed to be a god. This remains one of the core tenets of Buddhism, that there is no god and that the universe is somewhat tailored to each of us individually, though we are part of a larger whole. Humans are subject to the wild laws of karma and continue in samsara until we achieve moksha, or liberation. For more on the religion, please see my article on buddhism. The concept of Dharma is elusive to describe due to the complexity of the concept; it does not translate directly into english and is a complex esoteric Indian term to describe a vocation, calling, or path of righteousness that an individual follows in life. This extends out to the dharma of the world as a whole, which is either aligned or imbalanced (in which case it will soon be rebalanced). The idea exists in all of the Indian religions, most notably Buddhism and Hinduism, where Dharma is considered to be the path of duty and virtue that is right with the order of the universe. The path is righteous and winds in accordance with the laws of Karma until the cycle of Samsara is broken and Maya gives way to Moksha. The ultimate journey Dharma leads to the doorway of enlightenment. Enlightenment is the unlocking of the mind and freedom from the illusions of consciousness, more particularly thoughts. Thoughts take away from your ability to be present and receive the beauty and feel of the world around you, so at this point in the evolution of consciousness they are not necessary. Union is felt between all beings and awareness is supreme, a light against the darkness of ignorance. At least that is what it is supposed to be like. Ultimately, enlightenment has to be a spectrum, relative, as all things are. People that push the envelope, disrupt, change us, evolve us, these are the ones that are bringing enlightenment to the world. Martin Luther King, Gandhi, modern musicians, peace advocates, technologists pushing the world forward like Steve Jobs and Bill Gates are all people bringing enlightenment to our lives, but its hard to get to the truth of their lessons in the face of the lies that we are told from our first thoughts. We are bombarded with commercials and TV that convinces us to think about things certain ways that do not in any way conform to reality. Many people in the world succumb to the illusion that the world depends on things, when in fact the world depends upon human time. Instead of being focused internally, many are focused externally on survival, on being able to feed hungry mouths and try to win measures of comfort and vacations from your job that allow some measure of relaxation and bliss in an otherwise unfulfilling lifestyle. But the world is slowly changing. People are learning to prosper and how to share abundance. Nice things are only as nice as the people you can share them with and comfort is something that every human should have access to, but we are slowly learning how to take care of ourselves. The world is still divided and disconnected, but slowly it is connecting itself, using tools like the internet, cell phones, satellites, and so much more. We have hope for the future because it seems like a mass awakening is occurring, people are waking up. Practices like yoga and meditation are quickly becoming very available to the wealthy of the world, and soon after, the noble arts of internal surrender, meditation, reflection, breathing exercises, and energy movement will become available to everyone. In order to truly unite the world, people must unite through action; words mean nothing and have no weight when it comes to character. People are going to learn to prosper in ways that the world has never before know. I strongly believe that yoga is going to be one of those ways, I think the world is going to reform with the spread of eastern philosophies and ideas in the West. The world is learning to find its Dharma. The question of dharma beckons the questions of existence: Why does life exist? Does life have a purpose? What is the next step of evolution? Dharma attempts to answer these questions by saying that it is life’s purpose to be lived fully, completely. The next step of evolution is peace and life was meant to flourish and spread and unite the universe in life. Being is the purpose of all things. Dharma can also be considered vocational, or like a job. For instance, a doctor would have a dharma of helping sick people, or a computer programming would have a dharma of making more efficient algorithms for people to connect through the internet. I believe I find my dharma through teaching and practicing yoga, but it is far more complicated than just that. Music, traveling, friends, and family to name a few factors. According to Hinduism, the stability of the universe is dharma, the earth, gravity, the laws of physics are all propagated by this righteous force that is leading life. Dharma is intrinsically related to truth, or the natural and changeless state of all things, also known as Satya. The Buddha is the one that lived Dharma and his release into nirvana gives a model for us to follow. I think that perhaps the way to the true core of your being, of find your true dharma, is through silence and being alone. The buddha was alone for extended periods of time, many believe that Jesus was isolated as an Essene for his formative years, and many of the most famous transcendentalists isolated themselves. So did the most famous of philosophers. It gets to the core of your humanity, what is at the base of your existence. Your temporality. I think this is what I am going to try to do in India. See how much stillness I can find within myself. Maybe on the way I’ll find some truth. Buddhism is named after the Buddha, Siddhartha Gautama, who lived in about 500 CE. He was recognized as the enlightened one, or more literally, “awakened one”. He taught those who followed him how to avoid ignorance and suffering by the paths of knowledge and understanding. By obtaining truth and awareness, they would be granted nirvana, bliss and would become enlightened. The Buddha was born into a wealthy family; when he was young his father, King Suddhodana, shielded his son from all suffering, because wise men had foretold that the young prince, his son, would become a buddha. His father wanted Siddhartha to become a powerful ruler, so he showered his son in wealth and luxury. But the future Buddha became disillusioned and made four trips outside of his palace free from suffering. On these trips, he saw sickness, then old-age, then death. He despaired; “how can I enjoy luxury when there is so much suffering in the world?” (note the difference between Christ’s acceptance of poverty and suffering in the gardens of Gethsemane). On his fourth trip, the Siddhartha saw a wandering monk who had given up everything he owned to end to suffering. He left his kingdom to wander and find an end to suffering, as the monk had done. Siddhartha cut his hair and called himself Gautama and for six years he wandered, trying to find the wisest of men to study under. He found no one. For six years he practiced severe asceticism eating almost nothing, until he realized that his hardships would not lead him anywhere. He ended his fast and sat under a Bodhi tree on a full moon, where he began to meditate. But Mara, the evil one, found Siddhartha and tempted him, first with his daughters of desire, then with lightning, rain, wind, and storms, and finally with his demon armies of flame and fire. One by one, the Buddha stood his ground, unmoving from his meditation, defeating them with his virtue. When the struggle ended, the Buddha gained the most supreme knowledge and wisdom, having cultivated a deep and unceasing awareness. He became the Buddha, or enlightened one, and from then on he was called Shakyamuni Buddha. “All living beings have the buddha nature and can become buddhas. But you must do your own work, because I can only show you the way.” This is a combination of two quotes from the Buddha that I believe most completely encloses Buddhism. The religion is communally based, on teaching like compassion, love, forgiveness, and teaches detachment from the pleasures of the senses, very similarly to Patanjali’s yoga system. You can see that the Buddha, Patanjali, and Jesus are all very alike in their actual teachings and that there is a tremendous amount of overlap between the three. While they do overlap, each has lessons that are not contained in the other two. All three written collections of work were collected after the death of the primary figure, so much is unknown about each primary figure of the religion. The Buddha’s work was passed down in oral tradition for about 400 years, then transcribed in monasteries. The Buddha’s teaching is called the middle-way and calls for balance in every aspect of life especially between sensual indulgence and severe asceticism. He taught that the causes of suffering are greed and ignorance and that cause desire for the wrong things and ignorance of the laws of Karma and the function of the universe. There is suffering that is common to all (babies are born crying, no one wants to die, when we are sick we are miserable, and when we grow old we have pains in the body). which is represented by a wheel with eight spokes (see right), representing the eight parts of the path, which continues to spin throughout one’s life. The goal is to reach the center of the wheel, also known as Nirvana, or the supreme bliss. This can be equated to Samadhi in yoga, or the ultimate bliss of existence, the highest peaks of meditation. In the eightfold path, samyaksamādhi is known as right concentration which is meditation that leads to increased awareness. Just like every spoke of the wheel is needed for a wheel to keep turning, so is every path needed to attain nirvana. Following the path is often compared to growing a garden, where the plants are wisdom, the mind is the ground, and the thoughts are the seeds. Deeds are the way one cares for the garden and our faults are weeds. Pulling the faults as close to the seed as we can so they don’t root into the mind will allow for the garden to grow fully and result in a harvest of love, happiness, and fulfillment. There may be as many as 1.6 billion Buddhists in the world; it is recognized as one of the world’s fastest growing religions. Devotion is an extremely important part of the practice; you will often see people bowing before statues for long periods of time after a pilgrimage is made to a holy site, or chanting while an offering is burned at the feet of an altar. Buddhist monasteries are some of the oldest human organizations on the planet. They follow Dharma, or the eightfold path, and participate in Sangha, or the monk’s order. Most have obtained one of the four stages of enlightenment which are integrally tied to rebirth. For more on rebirth, see my article on Samsara. Arahant – a fully awakened person. This person has abandoned all sensual desires and will not be reborn; they are free from the clutches of Samsara. An Arahant has attained waking from the teachings of the Buddha; the title “Buddha” is reserved for Siddhartha Gautama, who discovered the path for himself. This is Buddhism’s structure of enlightenment, you can also see some interesting world views in the teachings. Buddhists believe in reincarnation and are trying to obtain liberation from Samsara, the cycle of suffering and life, to achieve Moksha, freedom. Zen Buddhists are simply Buddhists that place extra emphasis on mediation, mostly in China, Korea, and Japan. As you can see, there are tons of parallels and similarities in the eastern religions; Hinduism, Buddhism, and Jainism have a tremendous amount of overlap. Honestly, I could write about this type of stuff all day, I could write a post just on the Buddha, or the eightfold path, or enlightenment, or a comparative article between Hinduism and Buddhism. Let me know what you want to read in the comments!